Lost Lands guides are professional people who do this in addition to regular jobs because they love giving people an up close and personal introduction to Louisiana’s wetlands. 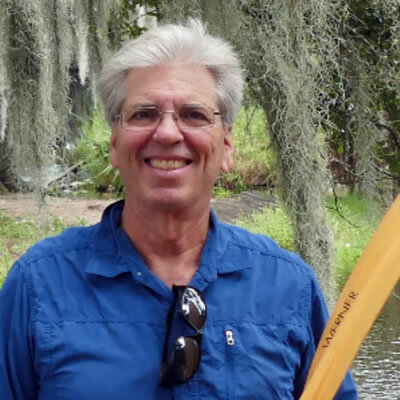 Bob Marshall is a Pulitzer Prize-winning journalist who has covered the people, stories, and environmental issues of Louisiana’s wetlands for more than 35 years for The Times-Picayune as well as for national publications. In 2017, he returned to the New Orleans Times-Picayune to write a regular column on environmental issues after a four-year stint at The Lens. In 1996 he was co-author of the Pulitzer-winning series “Oceans of Trouble,” examining the plight of the world’s fisheries and the decline of Louisiana’s coastal wetlands. In 2005 he investigated the missteps in building the New Orleans levees and floodwalls that caused 80% of New Orleans to flood during and after Hurricane Katrina, part of the package that won the Pulitzer Prize for Public Service. In 2007 Marshall was co-author of the series entitled “Last Chance: The Fight to Save a Disappearing Coast,” about Louisiana’s coastal erosion problems, which won top awards from Columbia University and the National Academies of Sciences. Here is one of Bob’s projects that explains environmental issues affecting the Louisiana coast: http://projects.propublica.org/louisiana/. 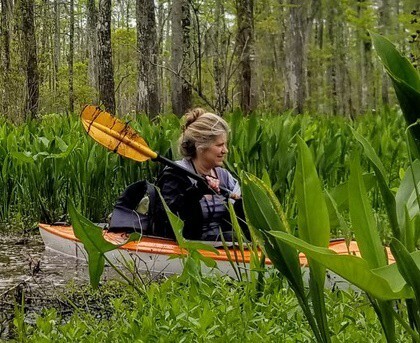 Marie Gould, founder of Lost Lands Tours, has spent more than 25 years boating and kayaking in the wetlands surrounding New Orleans with her husband, Bob Marshall. She had a long career working in education, including serving as the public spokesperson for the Louisiana Society for the Prevention of Cruelty to Animals for 12 years, and was a seasonal forest ranger with the US Forest Service. She ran a program that brought New Orleans children to the Colorado wilderness and rafting the Grand Canyon. Beaux Jones is an environmental lawyer, enthusiastic birder, and a skeptical optimist about the future of our delta. He is a native Louisianan who now lives in New Orleans with his wife Emilie and son Hudson. When not on the water or in the courtroom, Beaux prefers to be in a bike saddle on an unfamiliar road. 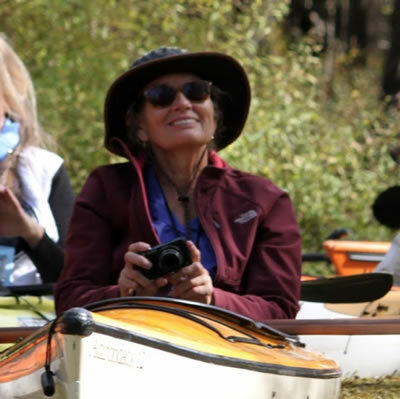 From time to time Lost Lands schedules kayaking tours devoted to birding and led by Beaux. Let us know if you want to join one of those tours. John Hazlett is a retired professor of American Literature at the University of New Orleans where he directed the BA in International Studies Program. He had taught at universities and directed summer programs around the world. 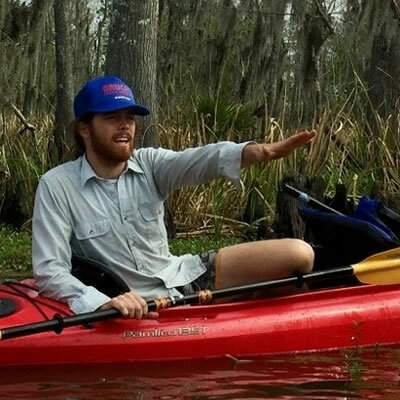 An avid kayaker (and failed fisherman), John is determined to navigate as many of Southeast Louisiana’s waterways as he can in the next ten years. 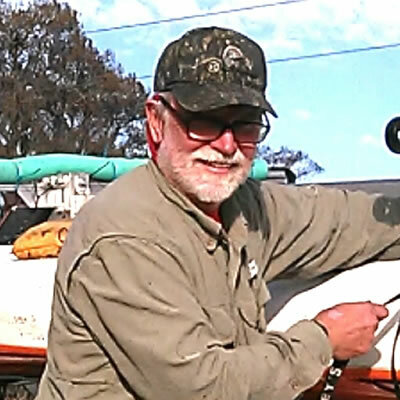 Since building his first kayak in the late 1970’s, Clyde Carlson has paddled many rivers, creeks, bayous and lakes throughout the Southeast United States. A retired civil engineer, he now enjoys showing the natural beauty of the swamps and marshes to locals and tourists alike. 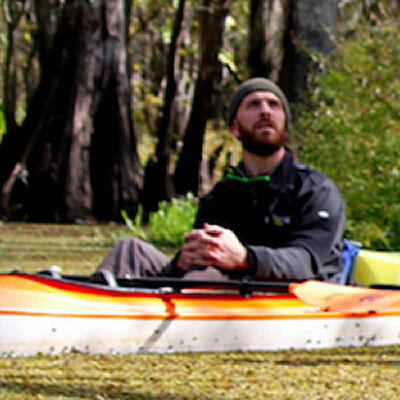 When not leading kayak swamp tours, Clyde enjoys fishing, canoeing, and bicycling with his family and friends. Katherine Mattes is a Professor and the Director of Tulane Law School’s Criminal Justice Clinic. When she’s not swamped with work, Katherine seeks refuge by kayaking in the Louisiana wetlands. She moved to New Orleans from Southern California in 1995 to be closer to Jazz Fest. After arriving in New Orleans, she became so enchanted with Louisiana’s wetlands she and her husband were married on a boat in the swamp. She loves introducing visitors to its unique beauty and tranquility that changes with the seasons. Chris Staudinger uses various mediums to tell stories of water, rivers, the queer landscapes they make, and people’s relationship with them. 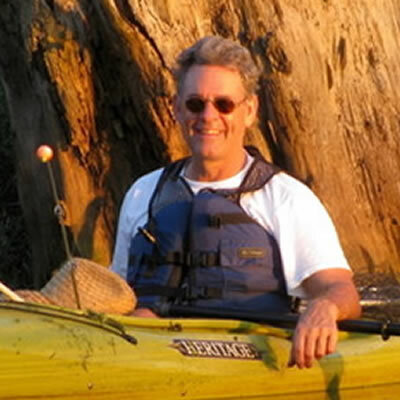 He writes for various publications and guides canoe and kayak trips in the Louisiana wetlands and the Mississippi River. Chris is currently working with local writers to use stories about water to build a paper canoe.